New reports show how physicians can improve patient safety and help themselves with two simple steps: Stopping the practice of conducting surgeries at the same time on different patients, and writing prescriptions electronically instead of by hand. Investigative journalists at the Boston Globe deserve credit for reporting on a dispute over elite surgeons’ conducting several complicated operations at the same time. Surgeons defend this long-standing practice, saying it lets them help more patients and teach residents, and hasn’t been shown to be detrimental. But staff at one of the nation’s leading academic medical centers disagree. They have criticized the practice, and told their leadership that they fear multiple, concurrent surgeries endanger patients. That has created an internecine conflict in the institution, pitting select, top surgeons against each other and hospital staff. The Globe, in its investigation, reported on a Bostonian who suffered paralysis during a difficult, complicated spinal operation. His renowned specialist went in and out of that operation because he was also operating on another patient with an equally complex and demanding procedure. Professional organizations are scrutinizing existing guidelines about this practice, and it has drawn the scrutiny, the Globe says, of a U.S. senator. Frankly, as someone who has seen how lots of operations can and do go wrong, it’s unfathomable why surgeons for ego or financial reasons would jam themselves up with several procedures at once. Surgery, to be fair, is physically and mentally taxing, especially when procedures are long and complex. Top docs are in plenty demand, and they have ample access to resources, like operating room time, residents and fellows, not to mention patients. It’s unconscionable that hospitals and colleagues tolerate this for patients’ and safety’s sake. Will New York lead the rest of the world into modernity with its requirement that doctors “write” electronic prescriptions from now on? 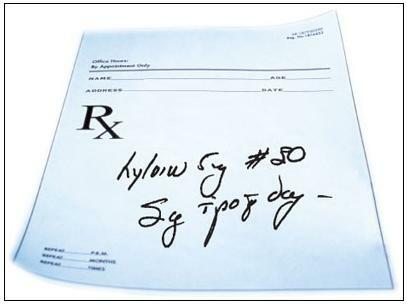 Physicians’ scripts, of course, have been the subject of endless jokes about MDs’ execrable, illegible handwriting. Handwritten prescriptions also need to go because authorities say they need more than ever before to track and crack down on drug abuse and illicit dispensing. As I’ve written recently, the federal government has sent the sternest possible message to doctors that they need to slash their dispensing of powerful, addictive painkillers. Adding electronic prescriptions to the increasingly prevalent e-medical records also could give physicians a fuller, more efficient picture of their patients’ health. It may give health care experts abundant new data with powerful insights about the use, effectiveness, and costs of drugs. Still, as comments on recent reports of New York’s change suggest, officials need to address consumers’ pragmatic issues with e-prescriptions. The change to e-prescriptions forces patients to know which pharmacy they want to fill their drug orders. If the meds aren’t available at the designated spot or prove to be costlier than at another vendor, patients can encounter major inconveniences. That’s because their doctors must cancel and resend the prescription elsewhere—and they may not be around at night or on weekends or holidays to do so. Patients also are expressing privacy concerns about databases that can be created with the e-prescription information. It’s a premise worth consideration: With the volume of patients that nurses and doctors care for, are errors almost inevitable? And are caregivers second victims when medical mistakes happen? An intriguing report looks at the big demands placed on doctors and nurses, and examines the huge toll these take, including the constant fear of doing something wrong that harms patients. The piece notes the prevalence today of “serious adverse events”—major medical errors– examining the sad effects they can have on nurses and doctors who commit them. The fear surrounding error, the author suggests, prevents caregivers from speaking out. It prevents the disclosure and conversations that could lead hospitals, in particular, to finding and preventing systems or procedural problems that lead to patient harm.